Mercedes-Benz Sprinter Limousine conversion are a class of their own. 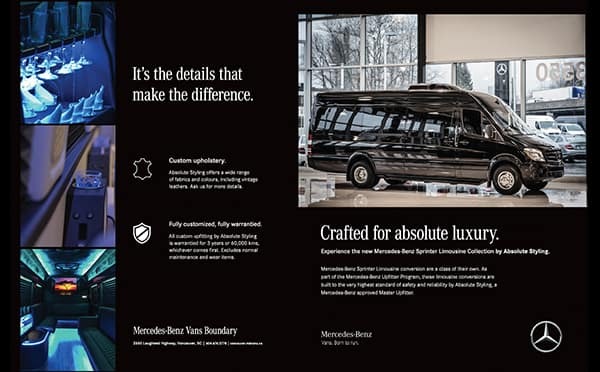 As part of the Mercedes-Benz Upfitter Program, these limousine conversions are built to the very highest standard of safety and reliability by Absolute Styling, a Mercedes-Benz approved Master Upfitter. 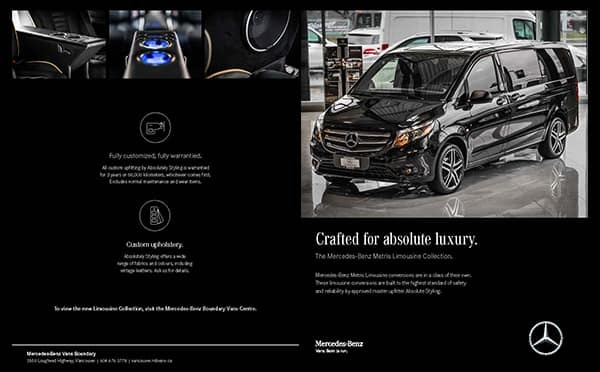 Mercedes-Benz Metris Limousine conversions are in a class of their own. These limousine conversions are built to the highest standard of safety and reliability by approved master upfitter Absolute Styling. With custom seating options, premium ambient interior lighting and more, it makes driving a pleasure for all. With custom seating options, premium sound system, ambient lighting, sound dampening and more, the journey really can be better than the destination.